Saratoga Springs, New York, with its genteel summer homes and horse farms framed by rolling hills and the mountains beyond, has always had a certain gilt-edged glimmer. 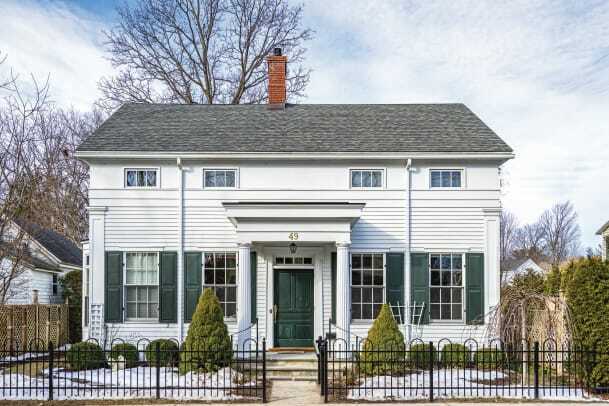 But when architect Milton Grenfell signed on to design a new house in town, it wasn’t a lavish project on a spacious piece of land; the project would be a modest home on a small narrow lot located on a historically blue-collar street near Skidmore College. 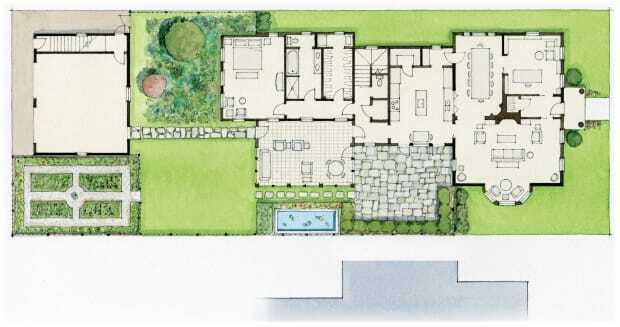 In addition to the challenge of working within the small lot without crowding the neighbors or sacrificing privacy, Grenfell got a major directive from his clients, Phyllis and Sam Aldrich: to incorporate aging-in-place features so the couple could look toward a future in their house. 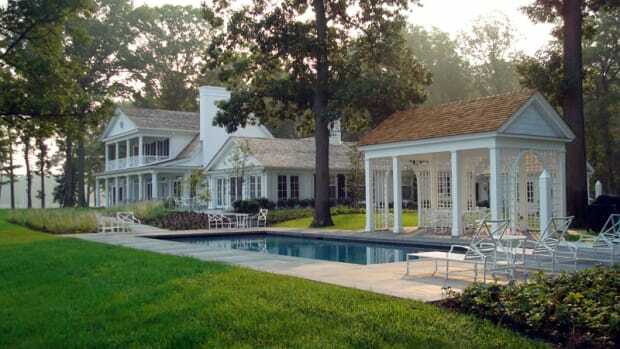 The flexibility of the Greek Revival language enabled Grenfell to turn out a classically beautiful plan that deftly addressed the project’s many program requirements. Grenfell took advantage of the style’s various features to render a house where the Aldrichs could age in place gracefully. For instance, one common Greek Revival feature—a tall frieze atop giant order corner pilasters—was the perfect device for forming a 1,545-square-foot half-story above a 1,895-square-foot ground floor, complete with a line of dormer windows set into the frieze. “The tall frieze allows more headroom in the attic,” Grenfell says. “We used this and other volumetric devices to give the family the amount of habitable attic space they wanted to accommodate the frequently visiting family and friends.” By hiding second-story space in the attic, the home’s one-and-a-half-story exterior blends with the rooflines and massing of surrounding houses on the street. The Doric columned front portico gives the house dignity, yet is understated so it doesn’t upstage the modest streetscape. Inside, all the most important rooms are on the first floor, including a spacious master bedroom suite projecting into the quiet rear gardens. Because the couple frequently entertains, the kitchen connects to the dining room via a butler’s pantry, for storing stemware, china, and linens, while also serving as a buffer between the two rooms. For cocktail parties and casual dining, there is also a shuttered pass-through for serving between the two rooms. “Little features in a little house can make a big difference,” Grenfell says. 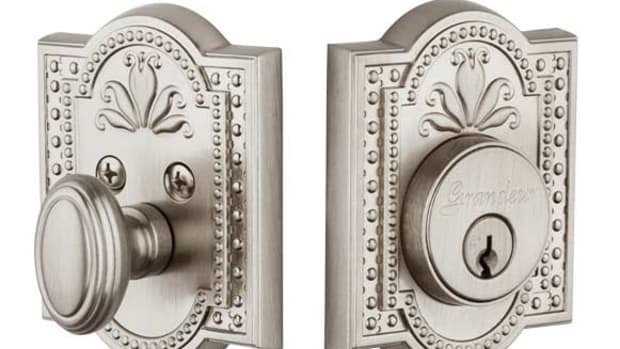 Grenfell believes that each room should have its own memorable character. For example, the south-facing breakfast nook off the kitchen looks onto a sunny garden terrace. Meanwhile, the formal dining room is on the north side. The library, on the southeast corner, catches the morning light. 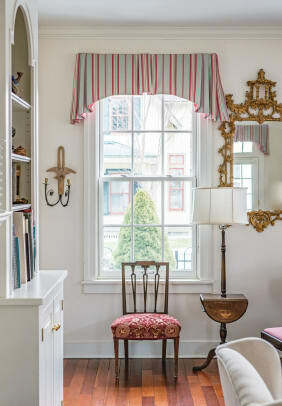 While the living room in the southwest corner room also faces the street, its bay window burnishes the room with afternoon light. Upstairs are two guestrooms with a shared bath, yielding plenty of space for hosting the couple’s visiting children and grandchildren. There is also an exercise room and a study for Mrs. Aldrich, a professor and scholar who taught for many years at Skidmore. The Aldrichs also asked for a detached garage on the alley, with the option of upstairs living space for a caregiver, in case one might be needed someday. The garage has another role, as well: forming a trellised privacy wall for the shade garden. 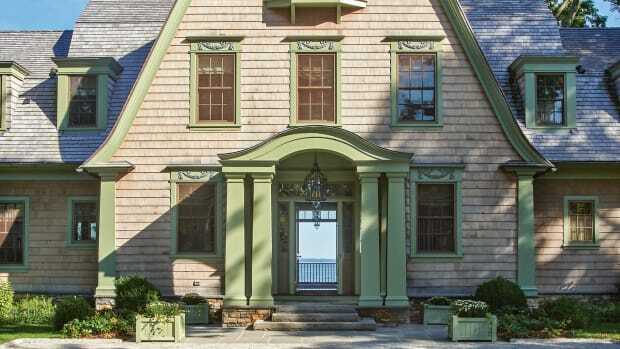 On the northwest corner is a lawn terrace, perfect for playing croquet and gamboling with grandchildren. A stepping-stone walk from the garage to a screened porch demarcates the shade garden on the northern corner from the lawn terrace. 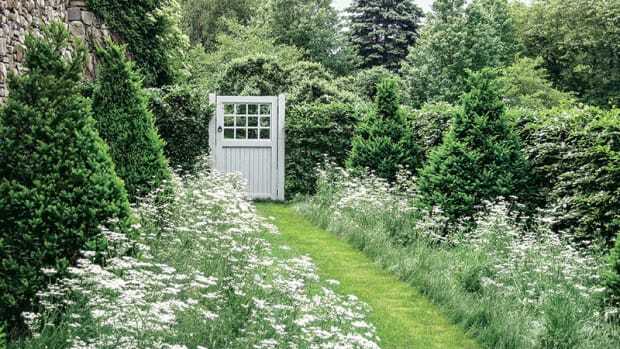 A kitchen garden with vegetables and herbs gets full sunlight from the east and south.